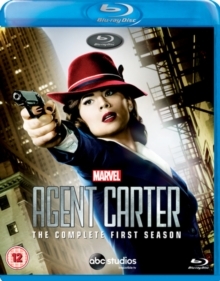 All eight episodes from the first season of the action adventure show starring Hayley Atwell as the Marvel Comics character Peggy Carter. Following the Second World War, Peggy returns to the Strategic Scientific Reserve (SSR) where she is reduced to performing secretarial work. When her friend Howard Stark (Dominic Cooper), an inventor and industrialist, is investigated by the SSR after being accused of treason Peggy tries to prove his innocence, helped by Stark's butler Edwin Jarvis (James D'Arcy), and demonstrates her skills as an agent along the way. The episodes are: 'Now Is Not the End', 'Bridge and Tunnel', 'Time and Tide', 'The Blitzkrieg Button', 'The Iron Ceiling', 'A Sin to Err', 'Snafu' and 'Valediction'.